[Above L-R] Back row: Jennifer Gallagher, Veronica Rivera, Bianca Brewer, Kelsey Millman, Tiffany Lo and Tabitha Wood. 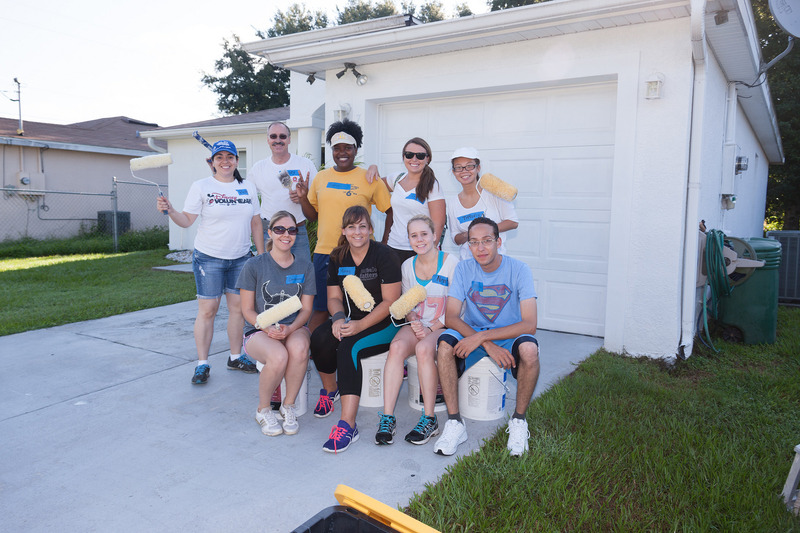 Bottom row: Generra George, Ashley Cunningham, Alexis Keirsted, Miguel Romero volunteered for the Fixin’ Up the Neighborhood project. In support of Orange County Mayor Teresa Jacobs’ Summer of Service initiative, local citizens worked together and volunteered in the program’s cleanup and community improvement events continuing the tradition of Orange County’s “neighbors helping neighbors” philosophy. The initiative, which is now in its third year, began on the first day of summer and connected citizens with Orange County Government and its partner agencies in 19 volunteer events. Since its inception, more than 850 volunteers have participated in the initiative. This summer alone, more than 400 volunteers participated in “Fixin’ Up the Neighborhood,” an annual project that focused this year on the Washington Shores community. Sponsored by the Orange County Neighborhood Preservation and Revitalization Division, it assists qualifying residents with home repairs and improvements. Watson’s home was pressure washed, primed and painted a light green color. A group of volunteers spent a weekend working on his home, as well as others in the community. Fixin’ Up the Neighborhood (formerly “Paint the Town”) began in 2003 and is made possible by a grant program. Orange County residents apply for the program with priority given to seniors and the disabled. Other 2014 Summer of Service events included storm drain labeling, restocking food pantries, and assisting the homeless moving to a new shelter. Service opportunities were provided by Orange County partner agencies including the Coalition for the Homeless of Central Florida, Second Harvest Food Bank of Central Florida, Goodwill Industries of Central Florida, Adult Literacy League, Seniors First, Inc. and Volunteers for Community Impact. For more information on Mayor Jacobs Summer of Service please visit the Summer of Services page. A collection of photos from the Fixin’ Up the Neighborhood event are available on Flickr for use by the media.